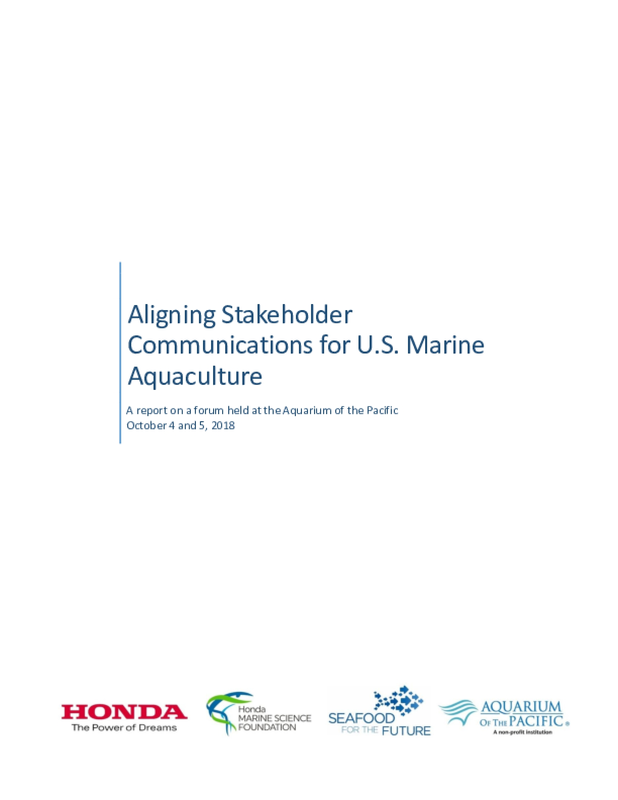 On October 4 and 5, 2018, the Aquarium of the Pacific's Seafood for the Future program and American Honda, in partnership with the Honda Marine Science Foundation, convened and facilitated a forum, titled: Aligning Stakeholder Communications for U.S. Marine Aquaculture at the Aquarium of the Pacific. The forum's goal was to expand responsible marine aquaculture, or farming in the sea, in the U.S. by facilitating the communication of accurate information to consumers, regulators, policymakers, and the public. The output will be a communications strategy to facilitate more cohesive and accurate messaging about U.S. marine aquaculture in state and federal waters among diverse stakeholder groups. Copyright 2018 by Honda Marine Science Foundation. All rights reserved.